Clipper Lighters are definitely not your average lighter and these new Jet Flame lighters are not your average Clipper. Assorted colors pop as usual but these come with an adjustable jet flame for windy conditions. Clippers are famous for their reliability and quality. Each one is made in Spain from strong nylon instead of cheap plastic. Won't crack and explode like cheap lighters and powerful enough for rough conditions in the great outdoors or just when you want to bring overwhelming flame to the party. 3000 lights from each one and it's refillable. 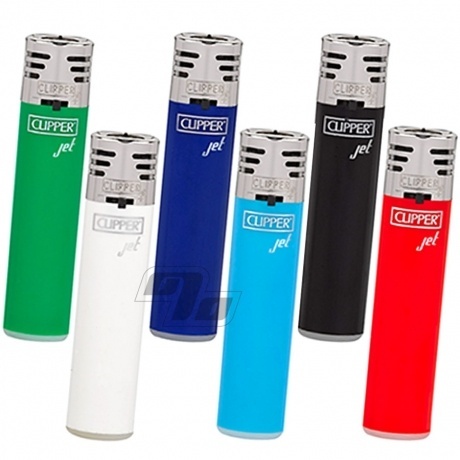 These Jet Flame lighter designs come in 6 colors; White, Light Blue, Red, Green, Dark Blue and Black. All with a silver top and black flame adjust and electronic ignition button.